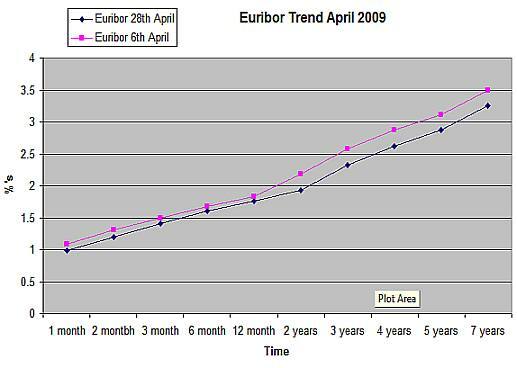 In watching the movements of the Euribor Yield Curve we saw that margins were likely to increase on fixed rates, however, over the month of April we are seeing the yield curve drop below levels seen at the start of the month and that will likely result in a repricing of debt. What we are seeing is the increasingly bearing outlook feeding through to interbank rates with the expectation of the May cut showing a strong likelyhood of going too 1%, that is why the 1 month money has actually dropped below that mark when earlier in the month it was slightly above it. The yield curve is generally feeding the market information about inflation and it would appear that after the May rate decrease that the medium term outlook is depressed. The lines hold a tight margin until the two year mark at which point the earlier curve trends higher and today’s keeps that c.20bip difference. Fixed rates don’t always change with rate drops because they are priced off of the future expectation of the price of money, but when you see the future prices trend lower one will thus expect the fixed rates to drop in the near future as well to reflect that new cost of funding. The one thing that may stop this from happening is that with rates at historic lows a bank may opt to compete more vigourously on short term rates or variables and keep their margin on fixed rates thus factoring in a significant bip gain on their margins. This would largely go unnoticed in the market because a good leading rate is what makes news. Variables can be cut to the edge of the cost of funds (in particular as 3month money is the actual working tool of banks) and raised at a lenders discretion, the thing to watch out for is the inflation trap this represents. If banks need margin (as they did in early 2008) they may opt to actually raise their variables when the ECB isn’t even moving. If we start to see rates climb then variable rate holders will have missed the fixed rate boat because those rates will rise before you have the chance to switch given the new lead times in processing a loan. If we were to see the inverse of this curve it would also fool a lot of borrowers because in the short term you could think rates were not going up and then as you march down the line you see costs rising but fixed rates will have gone up already meaning you have to ride the variable mortgage options because the margin on a fixed rate mortgage isn’t justified. I’m not trying to send readers to sleep with this…. Hey! C’mon! Wakey wake! (lol) just to make the point that fixing your mortgage in the near term could be beneficial in particular if we see movement around the 5yr fixed rate mortgage mark.